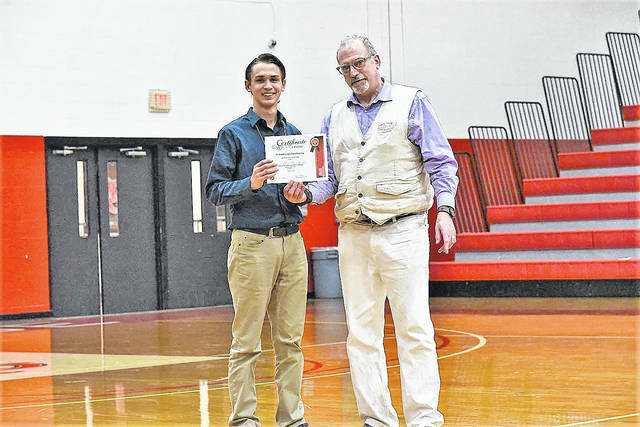 University of Rio Grande and Rio Grande Community College Provost Dr. Richard Sax presents Fairland High School student Sebastian Davies with the Rio Grande Science Day Scholarship. High school students from Gallia, Lawrence, Pike, and Scioto counties came to Rio’s campus for the annual District 14 Science Day. RIO GRANDE — The University of Rio Grande and Rio Grande Community College and the Gallia-Vinton Educational Service Center (ESC) hosted the annual Southern Ohio District 14 Science Day, on the university’s main campus. 117 students in 5th through 12th grades from across Gallia, Lawrence, Pike, and Scioto counties presented a total of 98 projects at the event. District 14 Co-Director and Rio Chemistry Program Coordinator John Means said it was exciting to see so many young students getting involved in scientific research. Means said he is grateful for the support and sponsorship of Holzer Health System, Fluor-BWXT, Southern Ohio Medical Center, Gallipolis Rotary, and R&R Tent Rental as well as the campus community. The students were vying for over 34 awards, which had a combined value of more than $3,700, that were presented at the end of the event. One of these awards, the Rio Grande Science Day Scholarship, was awarded to Fairland High School student Sebastian Davies. Twenty-eight students and 25 projects for State Science Day qualified for the State Science Day, May 12, while 12 students and 10 projects qualified for the Buckeye Science & Engineering Fair, April 7, which provides students with a path to the Intel International Science & Engineering Fair.